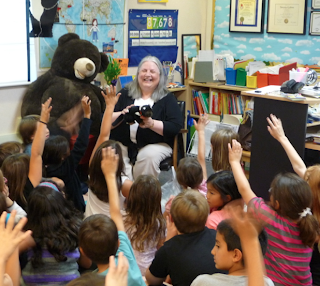 Mrs. Yollis' Classroom Blog: Meet Miss W. and Davo! Recently, Mrs. Yollis' class was fortunate enough to have the world famous Edublogger, Sue Wyatt and her pal, Davo the Tasmanian Devil in their classroom! Miss W. runs the Student Blogging Challenge and is good friends with Mrs. Yollis. Davo has his own blog called Traveling with Mr. Davo! 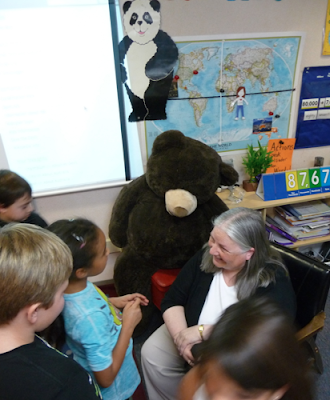 Everyone enjoyed meeting Miss W.! Miss W. has traveled to many of the states in America. Some students named a state and then placed it in the U.S.A. puzzle if she'd visited. The ones to the right are states she has not visited. How many states has Miss W. visited? What do you notice about the missing states? 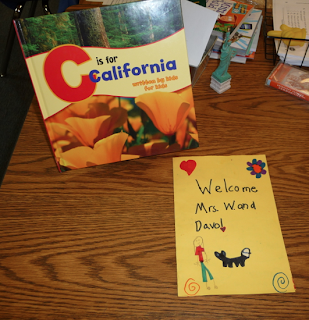 Mrs. Yollis' class gave Miss W. a special book about California and a card. 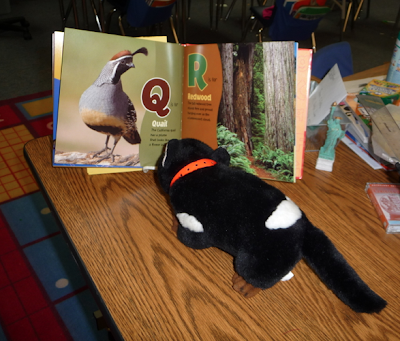 Davo enjoyed reading about the state bird, the California quail. Miss W. talked about Australia, especially her home state of Tasmania. She talked about the cartoon character called Taz. 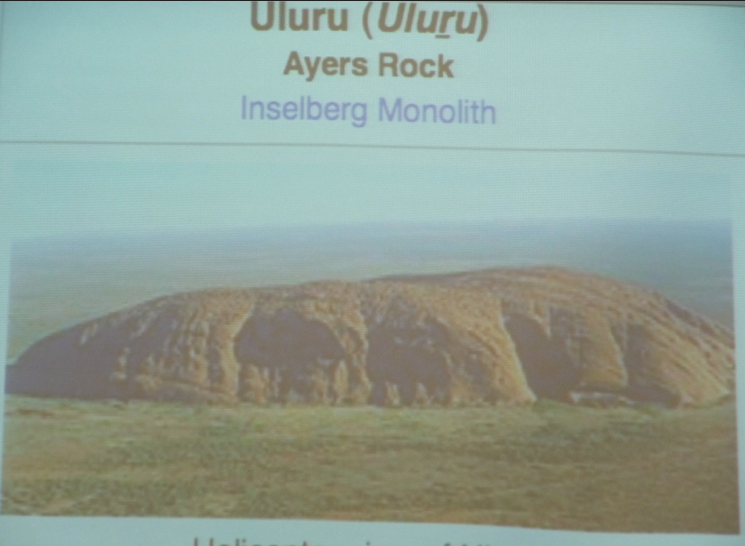 Do you remember any of the animals that are found in Australia? Do you remember any fun facts? Too much information to guess! Miss W. said that many people travel to Uluru and climb it. 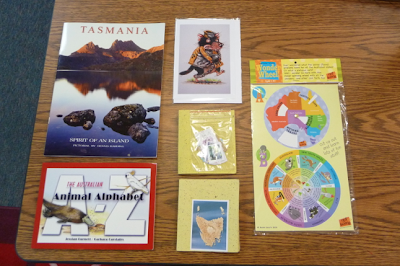 Many stayed after school to talk with Miss W.
Thank you, Miss W., for the wonderful Tasmanian souvenirs! Miss W. even brought a wonderful letter from one of Mrs. Yollis' blogging buddies in Kansas, Science Girl Em! What did you learn from Miss W.? What animal did you enjoy learning about? How fun to have a special visitor from Tasmania, Australia! I have never been to Tasmania, despite it being close to my state of Victoria. Of course there is the Bass Straight in between the two states, but it is a short plane trip. Being an "Aussie" myself, I know all of the animals that you displayed in this post, so I won't spoil it for the international visitors by revealing all of the names! One animal that wasn't on your post was the wombat. The wombat is one of my favourite Australian animals. We talked about this furry creature in our last Skype chat. There are two main kinds of wombat - the Bare-nosed wombat and the Hairy-nosed wombat. It looks like you all had a terrific time meeting Miss Wyatt and Davo! There is no doubt in my mind Miss W. is an amazing person. I was involved with the recent Student Blogging Challenge. It was wonderful to see how students progressed in developing their blogs. Some showed great talent and one person, named Ethan, I mentored has continued a connection through commenting with me. His latest reply to me on his blog received the longest comment I have written. As you know how much I can write large comments so that is something to say. The comment was over 800 words long. The letter Miss W. had from Em sounds interesting as she was another on my mentoring list. I was very lucky with the children in my list as there were some remarkable bloggers at work. The quality of their work often made me feel unnecessary as a mentor. I think I learned more from them than I was able to help. I have seen all of the animals in the pictures, although I have only seen animal #4 in zoos. I didn't manage to see a wild one when I was in Tasmania. Thank you all for this post. It was VERY interesting. What another wonderful visiter you all had. How wonderful that Miss W and Davo the Tasmainian Devil had a chance to meet you all. I hope Davo was on his best behaviour for you all as they can get rather crancky! I loved all the images of the AUssie animails. When I lived in Corryong often the local children would help raise baby joeys. I remember I helped to look after a tiny baby wombat. For its mother was killed while trying to get to the other side of the road. Unfortunately some of our native animals do get run over. I bet you learned a great deal more about Australia from Miss W.
Your post about meeting Miss W was so interesting to read! It looks like you had a wonderful time visiting with her. When we saw her she had only been to 3 states. I like how you put the pieces on the USA map to all the states she had visited on her trip! I wonder how many miles she put on her car. Did she tell you? I hope you get lots of guesses on your Australian animal photos! 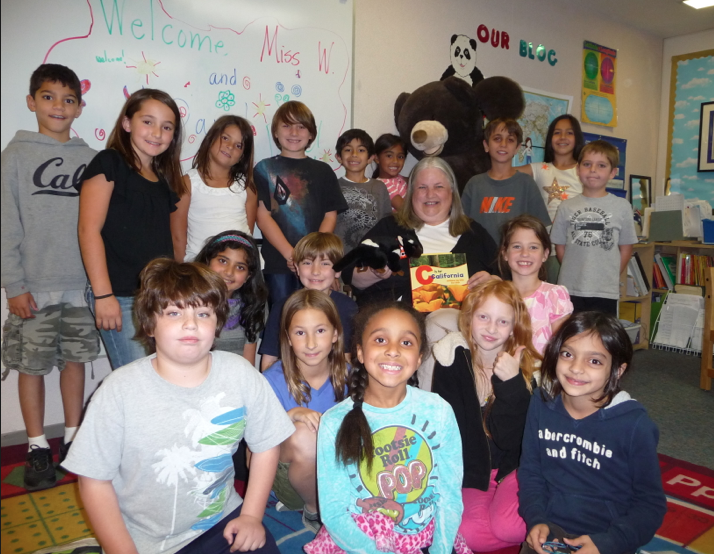 It was so much fun when Miss W. came to visit! I really enjoyed listening to her. I learned a lot from Miss W., but the information she gave us about the Tasmanian devil was the most interesting. 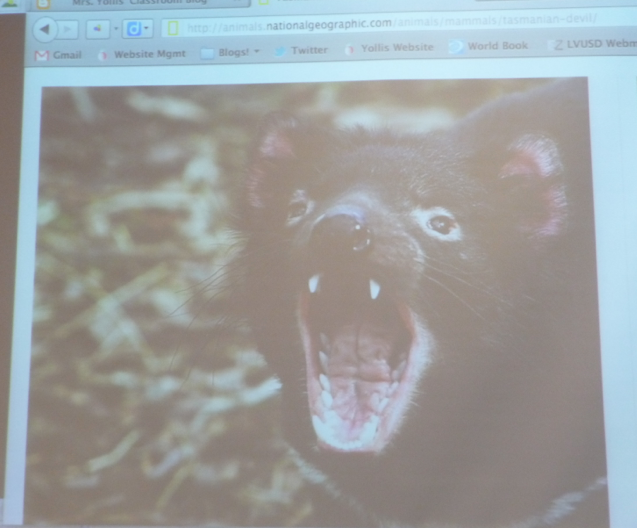 I was really sad to hear that a lot of Tasmanian devils are dying from facial tumors. 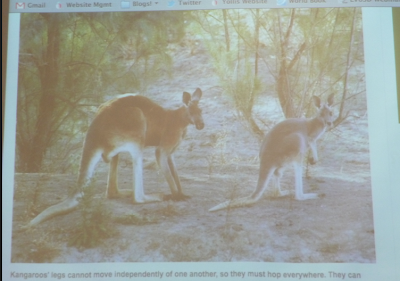 • #1 is a red kangaroo. 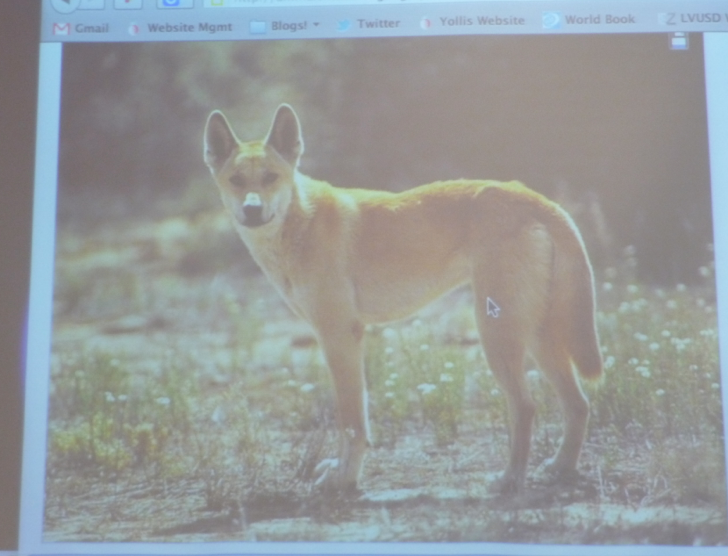 • #2 is a dingo. • #3 is a platypus. 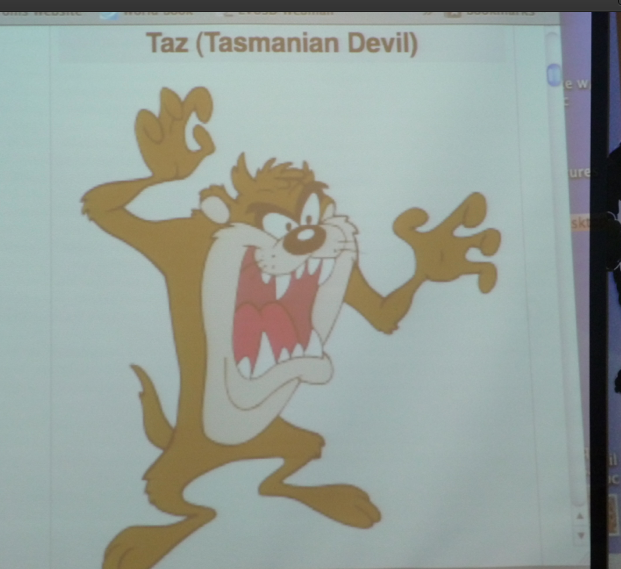 • #4 is of course a Tasmanian devil. What an awesome learning opportunity! Can you imagine this happening without making these connections through blogging and commenting? I am very jealous of the time you got to spend with Miss W. My students would have loved to be able to ask the questions you were able to ask and listen to the answers. I had so much fun when Mrs.W came to our classroom! It was very sneaky of Davo to hide behind the visitor count. I knew he would find a way to stay in our class! I would really love Davo to come and visit my house. If he did, I would do homework, practice piano,and go to my basketball practice with Davo. 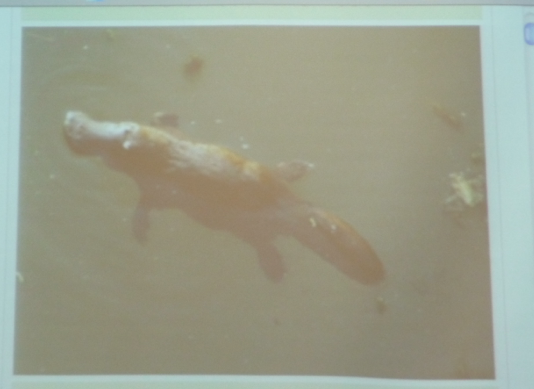 I would like to answer the questions regarding the animal pictures. The first animal is a kangaroo. 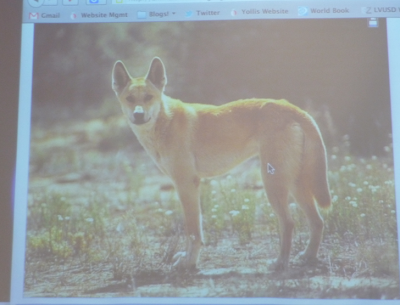 The second animal is a dingo. 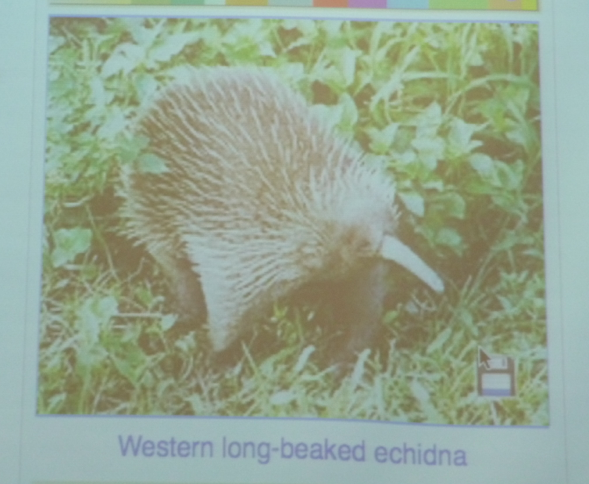 The third animal is a platapus. Finally, the last animal is a Tasmanian Devil,just like Davo. My favourite Australian animal is Crocodiles, because they really fun to learn about. What is your favourite animal in America?